Reverend Stephen Burr appointed Pastor of Presentation/Our Lady of Victory Parish, Detroit, effective July 1, 2017, in addition to his ongoing responsibilities as Vice-Rector and Dean of Formation at Sacred Heart Major Seminary. Formation is at the heart of our work at the seminary. Father Burr was appointed to the Sacred Heart faculty by Cardinal Adam Maida on July 1, 2008. He is also assigned to the faculty of Liberal Arts. Father Burr earned his AB at Sacred Heart in 1998, and then his MDiv 2002. He was ordained on May 18, 2002. Father Burr has served the Detroit archdiocese as parochial vicar at St. Andrew Parish (2002-2005), Church of the Divine Child (2005-2007), and most recently at Our Lady of Good Counsel (2207-2008). He also has served the archdiocese on the Assignment Board from 2004-2006. The variety of experiences that Father Burr brings to Sacred Heart will be a tremendous addition to the formation program for the undergraduate seminarians. We welcome Fr. Burr to our community of faith, and look forward to working together as we spread the "Good News" of Jesus Christ . 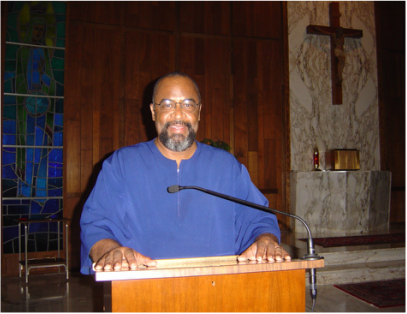 ​Reverend Mr. Hubert Sanders was ordained Deacon in October of the year 2000. In July of the year 2003 Adam Cardinal Maida, the Archbishop of Detroit, appointed him as the Pastoral Administrator of Presentation Our Lady of Victory Church. Reverend Sanders is married to his lovely wife Wanda. God has blessed their marriage of 43 years with two children Hubert Jr. and Kimberly Anne whom both are adults at present. The deacon is a retired manager from the beverage industry. He is also a retired First Sergeant from the United States Army. Deacon is one of four Deacons in the Archdiocese of Detroit to have received this honor. ​Deacon Sanders states, "We are all created by God for God. Because of His overwhelming love, He became man to redeem us. He calls us all in some way. Sin separates us from Him and somehow our sensitivity to that which is pure is muffled. Let us all be renewed in Him by turning away from that which destroys us. We can then begin to live with that peace that passes all human understanding". Here at Presentation Our Lady of Victory Church, we are committed to continue to seek to hear the voice of our divine shepherd Jesus. It is not by chance that we have been given this message to share at this time.